Silver Chameleon: Animation Backgrounds Named BLOG OF NOTE! 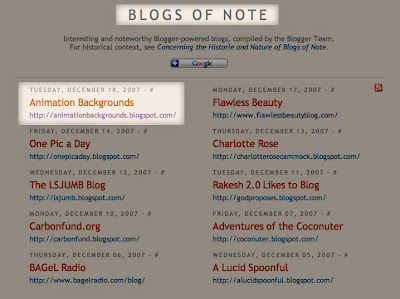 ANIMATION BACKGROUNDS has received the honor of being named a "BLOG OF NOTE," today, December 18th, 2007. I've gotta tell you, I am really knocked out! Many thanks to the good folks at Blogspot and Google. Of the umpteen zillion blogs out there, it is amazing to have mine acknowledged this way. My career is as a professional musician. But my passion for music is matched by my admiration of the animation art form. Since I can barely hold a pencil, animating is out of the question. But I know how to manipulate images in Photoshop! Digitally re-creating classic backgrounds is my way of participating in the animation art form, and my way of paying tribute to the artists who created the cartoon landscape in which characters come to life. Piecing these backgrounds together is incredibly rewarding. It is fascinating to see a background revealed, and to study the B/Gs as pieces of art in their own right. I'm planning on a long run here. We'll continue the holiday and winter theme through New Year's Day. Then, we'll return to the usual potpourri of diverse artwork from various films. Thanks again, Blogspot and Google. And many thanks to my readers, and loyal animation fans worldwide!